In what amounts to RoboCop meets Short Circuit, Neill Blomkamp’s latest, Chappie, celebrates the outsider. 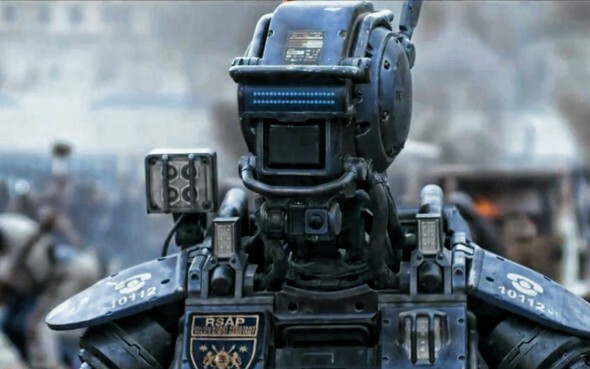 Chappie is the first sentient robot, his consciousness a program crafted by the engineer behind Johannesburg’s “scout” police force. The scout robots – a simple form of artificial intelligence assisting the Jo’burg po po – have all but eliminated urban crime. Two problems. 1) A handful of the city’s remaining thugs want one to help them pull a heist, and 2) a weirdly coiffured rival engineer (Hugh Jackman) believes AI is an abomination and thinks his own robot – controlled by a human brain – is superior. Imagine how pissed he gets when he finds that his rival Deon (Dev Patel – everywhere this weekend) has taken the body for one of his scouts and given it life. Blomkamp’s third film proves that he is kind of entrenched in a single story: the corrupt wealthy versus the damaged poor with an innocent outsider hero to bring it all together. But in Blomkamp’s hands, the story always feels wildly, deeply his own. The fact that he tells it through richly imagined characters doesn’t hurt. Chappie tells this tale with more heart and enthusiasm than the director’s last effort, the middling Elysium, but it lacks the originality (obviously) and much of the tension of his impressive debut effort, District 9. His film suffers from an abundance of sentimentality and attention-seeking. Jackman’s over-the-top aggression and bizarre costuming are almost overshadowed by the often fascinating (though sometimes cloying) oddity that is the duo of Nija and Yo-Landi Visser (South African rappers cast as Chappi’s thug-life parents). Blomkamp favorite Sharlto Copley performs admirably as the maturing robot-child Chappie, though you can’t help but feel abused by the manipulative child-mind/adult-world theme. Blomkamp, who also wrote the screenplay with District 9 collaborator (and wife) Terri Tatchell, finds fertile ground in the images of Johannesburg’s criminal population, and when he can keep the sentimentality in check he does a nice job of balancing drama, comedy and action. His real aim – as is usually the case with decent SciFi – is social commentary. The consequences he leaves unexplored in his film are so big and complex they are often the entire storyline of other films, but Blomkamp has his muse to follow. Chappie is true to his creator’s intention, and though it’s certainly a flawed and limited image, the experiment is not a complete failure.